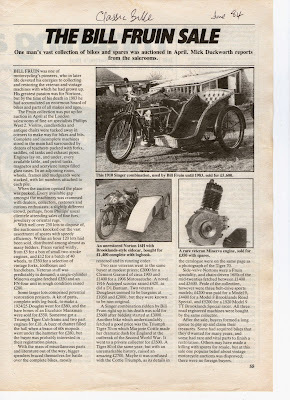 -SG- Back in October we had a posting of a 1923 SV Norton with sidecar attached, for sale in Holland. As is sometimes the case, the details provided by the seller were a touch fanciful but the bike came from Bill Fruin's collection. The other day I happened to come across the report of the sale back in April 1984 and the outfit concerned is illustrated in it. Bill was particularly interested in SV Nortons and 'created' a few with seemingly sporting pretensions of which this outfit is one. A solo from the same sort of period was also built which finished up in the Meriden Museum, also supposedly a Brooklands racer but nothing of the sort in my (biased) view ... I attach the sale report and, many thanks to Martin and Chas, scans from the Phillips catalogue showing Norton details (click this link).